Halong Party Hostel i Ha Long, Vietnam: Reservér nu! Cancelled or modified 3 days before arrival, no fee charged. Cancelled or modified 2 days before arrival, 15 percent charged. Cancelled or modified 1 day before arrival, 50 percent charged. Within 1 day or in case of no-show, the total price will be charged. The rooms are non-smoking areas however you can smoke on a balcony area and in the bar area. Any unnecessary damage (such as results of heavy drinking) will be paid for by the ones that caused it. All nights of accommodation and pre-booked tours must be paid for on arrival. The reception area is open from 7:00am until 11:30pm and we are a strictly adult only hostel. The Management and Staff reserve the right to refuse accommodation to anyone or end their stay early. In case of any kind of property damage, we have a right to charge your credit card, to cover incurred losses. Age policy is between 18 and 40 – we keep the right to REFUSE guests we feel will not enjoy the party atmosphere! 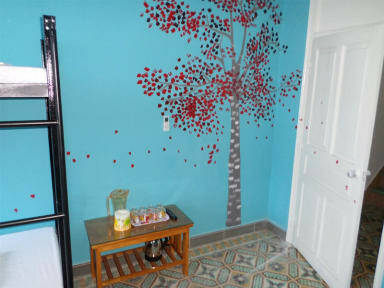 The Halong Party Hostel is located in Bai Chay at the heart of the Halong Bay tourist area 5 minutes walk to the imported white sand Halong Beach. With restaurants, shops and nightlife on the doorstep our new party hostel is so much more than just a bed! We boast a large downstairs air conditioned common area with sofas, wifi, 50″ flat screen satellite television and the Halong Party Bar which is open from 12midday till late. 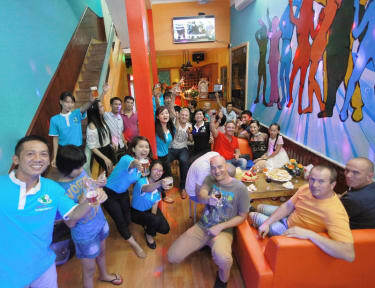 The English speaking tour and travel team can inform you of our selection of Halong party tours and cruises. The British run team at the Halong Party Hostel will make your stay here in Halong Bay one of the best experiences you have in Vietnam. We have a maximum capacity of 46 people at our Party Hostel and Party Hotel and are always busy so please make sure you book early. All of our 6 dorm rooms, 2 Deluxe triple rooms, 2 Superior twin rooms and 2 superior double rooms are air conditioned with fans and ensuite bathrooms. The extra large custom made bunk beds have huge lockers underneath the bed with lock boxes to keep your valuables safe. Each of the mixed and female only dorm rooms has a 32″ Flat Screen Television with loads of channels available. Breakfast of eggs, toast, fruit and coffee between 7.00am - 9.30am. FREE BEER (Vodka mixed with coke) from 8pm - 9:30pm every day. 1).The hostel rooms are a non-smoking area however you can smoke on a balcony area and in the bar area. Between 11 PM and 6 AM people who are not our guests or members of staff can not be in the hostel area. All the unnecessary damage (such as results of heavy drinking) is being covered by the ones that caused it. All nights of accommodation must be paid for on arrival. 2).Reception area is open from 7am until 11:30pm and we are a strictly adult only hostel. Please be aware there is a bar downstairs. -If cancelled or modified up to 3 days before date of arrival, no fee will be charged. -If cancelled or modified up to 2 days before date of arrival, 15 percent of the total price of the reservation will be charged. -If cancelled or modified up to 1 day before date of arrival, 50 percent of the total price of the reservation will be charged. -If cancelled or modified later or in case of no-show, the total price of the reservation will be charged. This hostel was terrible. The room smelled like mold and there was funges on the wall in the bedroom and in the bathroom. There was A LOT of dust on the aircondition and the air from it smelled like dust due to lack of cleaning. The madress was hard like stone and the staff was not friendly. Not a nice experience.